Your wedding is the most important day of your life, at least for now. There are many exciting things you have to look forward to, but for now, your wedding planning probably consumes a lot of your time and thought. Choosing your bridesmaids dresses might be the most important thing on your list aside from your wedding dress. That’s why it’s critical to know how to find the perfect one. You can base this choice on objective factors instead of being torn emotionally between several different dresses. There’s nothing wrong with shopping for bridesmaids dresses you like. You probably have a color family you want to stick to, and that’s ok. But other than that, use the following tips to help you make the right choice, so you’re not stressing out about another thing. The type of bridesmaids dress you choose will depend on the season. If you’re getting married in the summer, short dresses are more appropriate than they would be in the winter. You can go strapless, backless, or short, and no one will bat an eye. Winter weddings lend themselves well to halters, long sleeves, or something that covers more of the upper body because it’s cold outside, and the general dress of your guests will be layers of warm clothing. You also want to keep in mind your wedding party’s comfort if you decide to take pictures outside. A springtime wedding rejoices at pastel color palettes while a fall wedding screams for earthy tones. Use the season to guide many of your choices, so you don’t have so many decisions to make when it comes to color and style. Your venue will dictate the style of your wedding to a certain degree. If you’re getting married in a church, you may want to stick with more conservative styles instead of choosing dresses with a lot of flair. Higher necklines and overall coverage are best in this situation. If you choose to get married outside, refer back to seasonal guidelines to make sure your wedding party is comfortable in whatever the weather might be like. Anything goes in a modern or third-party venue because whatever you choose will be a reflection of who you are. Formal venues will call for formal attire while more fun, flirty, or relaxes styles look great in relaxed venues. The time of day can help you choose the perfect bridesmaids dresses as well. An evening wedding is more formal than an afternoon wedding. Typically, a Friday evening or a Sunday afternoon is also less formal than a Saturday evening. Bridesmaid dress can often take up to two or three months to come in if you have to special order them, and another four to six weeks for alterations. Make sure you allow enough time before your wedding date for ordering and altering. While alterations can be done in as little as two weeks, often a second fitting will require some touch-ups, so you need to allow time for that. It’s much easier to take in a dress that’s too big than it is to let out a dress that’s too small. Emphasize the importance of measuring for a bridesmaid’s dress, especially if your bridesmaids don’t live in town. Dress sizes are not like regular clothing sizes, so chances are, everyone will go up a size or two, and it’s important to be sure when you’re ordering them online. Typically, it costs less than $20 to hem a dress. Most dresses will at least need to be hemmed if nothing else. Ensuring the dress is the right length will not only make everyone in the wedding party look neat and uniform, but it will also keep them from tripping and falling over their dress. Rarely does a bridesmaid dress fit perfectly off the rack, so in addition to hemming, common alterations include taking in the bodice to fit better around the waist and adjusting the straps to fit snugly against the shoulders. The total price varies, but it can cost anywhere from $100 to $500 to alter a single dress. A lot depends on how complicated the alterations are. Wedding dresses are much more elaborate than bridesmaid dresses, so they will cost more to alter. A good general rule to keep in mind when choosing the dresses is the simpler the dress, the less expensive the alterations. Can You Dye a Bridesmaid Dress? The short answer is, yes. But be very careful. If you plan to dye your dresses, there are some things to know. First, you can only dye it darker. If you purchase a blue dress and want to dye it pink, that’s not happening. Fabric type also has a lot to do with whether you can dye the dress or not. Some fabrics won’t hold color. If your dress has embellishments like rhinestones, you’ll be dying these, too, so if that’s not what you want, dyeing isn’t the route to go. If you can’t find a color you like and you are set on dyeing your dresses, choose a bridesmaid dress that’s meant for dyeing. It needs to be a very light color, preferably in a cotton blend that will color evenly and hold the dye fast. Dyeing a bridesmaid dress is possible, but there are a lot of factors to consider, and you are likely better off finding one in a color you already like. Should a Bridesmaid Dress Touch the Floor? If your bridesmaid dresses are floor length, they should touch the floor while your bridesmaid is standing. This is the appropriate length for a floor length gown. However, if you choose a dress that is not floor length, then the correct length will depend on the person and the style of the dress. 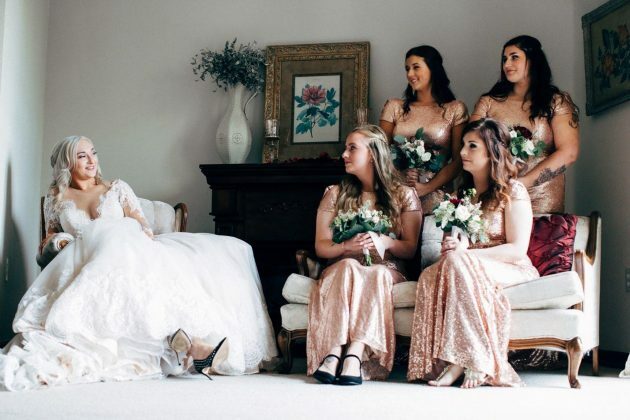 No one should ever outshine the bride. That being said, bridesmaid jewelry is a matter of personal preference. Some want it to be very subtle, while others like it over the top. You will know your personal preference. 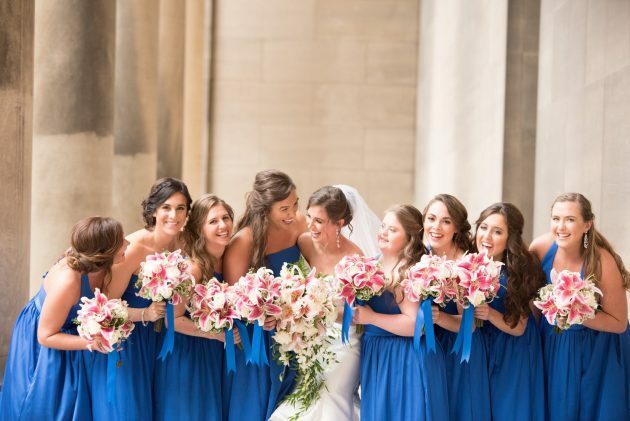 Some brides care very much about whether their bridesmaids match and others don’t. This may also help dictate how you want your ladies to accessorize. It’s becoming more popular now to dress your bridesmaids in a style that looks good on them personally while keeping it all in the same color. The same often goes for jewelry. What looks good on one, won’t look good on another. It can be a point of stress for some brides to choose something that looks good on everyone when that’s hardly possible. As long as everyone is wearing something that looks good on them, no one will notice the difference. There’s certainly a lot to think about when choosing bridesmaid dresses, but don’t let it stress you out. The important thing is that everyone looks great and has fun. If that means a different dress for every person, that’s ok. Have fun and use these tips to choose the dress that works for your circumstances.